I always like to customize my mobile phone, since the first one I had a bunch of years ago. But for no apparent reason, I've always had problems when trying to choose the appropriate ringtone. Now it looks like I found the end to my problems in ToneShop. This great application enables you to create your very own customized ringtones in just a few steps. It's compatible with many phone makes and models (including iPhone) and phone ringtone formats, and it's ridiculously easy to use. Simply select your favorite song and crop it to the fragment you want to use as ringtone, which you can do with the program's built-in basic editor. This cropping tool doesn't allow much preciseness so you may as well use a third-party sound editor. Then select the format you want to export your newly created ringtone to, and you're done! We used an MP3 file to create a new tone for an iPhone and it all worked perfectly well. Beware that your mobile phone may have restrictions about the ringtone's size and length. Also, note that you need to connect your phone to the PC in some way (USB cable, IR port, Bluetooth) in order to transfer the ringtone to the device. In the case of iPhone, just open the M4R file in iTunes and sync the ringtones folder with your phone. Give the ultimate customizing touch to your mobile phone by creating your own personal ringtones. It's fast, very easy and totally free! Never pay for ringtones again. Ever! 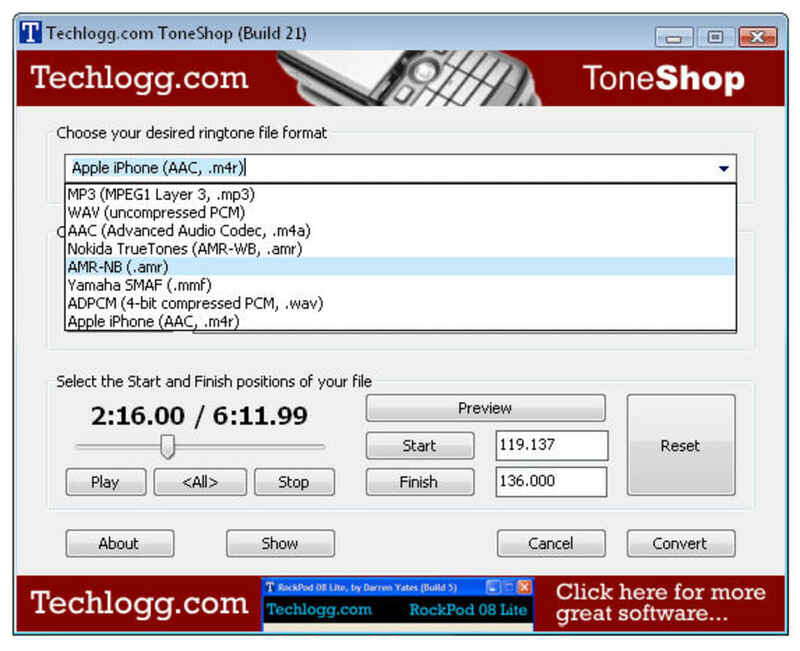 Techlogg.com’s ToneShop allows you to turn any WAV, WMA, MP3 or M4A audio file into your own custom ringtone - all for free! With its simple interface, ToneShop can help you make your own ringtones down to the millisecond and even preview your ringtones. All you do is choose the ringtone format you want your ringtone file to be in, load in your original audio file and choose a save filename and location. Next, you use the play controls to listen to your audio file and locate the portion you want to become the ringtone. You can use the trackbar slider at any time to navigate through your audio file. When you think you’ve found the starting position for your ringtone, press the Start button and the exact starting time down to the millisecond will appear in the box next to it. Do likewise with the Finish button when you think you’ve found the end. Now, press the Preview button to hear how your ringtone will sound. At this point, you can now manually edit the Start and Finish times by clicking in the text box and type in new values. Once you’re happy with how your ringtone sounds, press the Convert button and ToneShop will do the rest. After its completed the conversion, just transfer the ringtone file to your phone and activate it as the new ringtone and you’re done. Simple and Fast!. It doesn't get any easier than this to make ringtones! This is the best product out there for doing the job! Pros: Simple and fast. EXCELLENT. Really easy to use!!! you should download it seriously. It does exactly what I was expecting to: i have a Blackberry and i wanted to have some tones with my blackberry player but it always started with the begginning of the song and i wanted the chorus.. Thank you very much! BRILLIANT!!!!!!!!!!. So nice to have your own songs as ringtones, which i found very dissapointing when i got my iphone and couldn't put my songs on as ringtones, but this download has made it possible, many thanks. it works, is quite easy to follow and fast.